Shopping for Batman v Superman: Dawn of Justice Statues? Wonder Woman stands tall and strong. Exceptional 1:6 scale polyresin statue! Based on the Batman v Superman: Dawn of Justice film. The warrior demi-goddess stands 12-inches tall on a movie-themed base. This exceptional 1:6 scale polyresin statue based on the Batman v Superman: Dawn of Justice film features impressive detailing and stands on a movie-themed base. 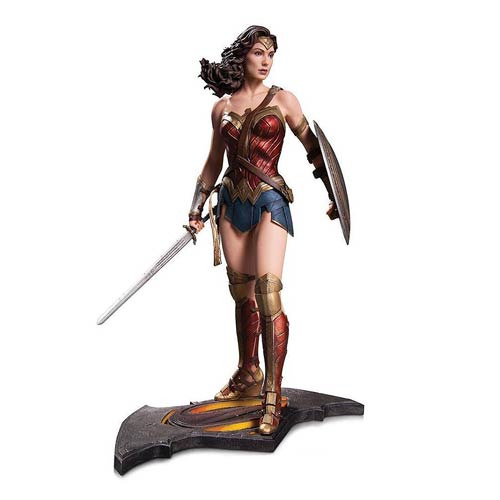 The warrior demi-goddess stands tall and strong in the Batman v Superman: Dawn of Justice Wonder Woman 1:6 Statue that measures about 12-inches tall. Display her with DC0325 Batman v Superman: Dawn of Justice Armored Batman 1:6 Statue and DC0327 Batman v Superman: Dawn of Justice Superman Statue (sold separately)! Ages 13 and up.